What are the odds of getting a perfect bracket? Ahh, the NCAA Men’s basketball tournament. A once a year tournament that drives over millions crazy with it’s unpredictability and excitement. Every year, each person goes into each year’s tournament with confidence thinking they picked the best bracket. The first ever 100% correct bracket, when in reality their bracket gets busted in the first couple days due to a cinderella team or close upset. Yes, this is a challenge that seems impossible. And for good reason. There are 9,223,372,036,854,775,808 possible ways to fill out a bracket. That’s a one and 9 quintillion chance of getting a perfect bracket. 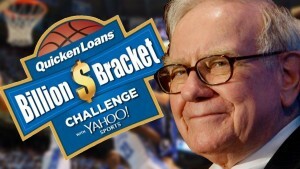 Understandable though, people play each year in hopes of winning Warren Buffet’s One Billion Dollar Challenge. To put that into perspective, someone has more of a chance to win the Mega Millions lottery two times in a row buying one ticket both times. Having a perfect bracket is like flipping a coin and having it land on heads 63 times in a row. Jeez. Now it is more possible to have a perfect first round. Even though it’s not a perfect bracket, a perfect first round is nothing to scoff at. In fact, someone has a 1-17,000 chance of picking a perfect first round. Now a 16th seed has never beaten a number 1 seed, so you really only have to worry about picking 28 games correctly early on. The person who has made it the farthest into the tournament with a perfect bracket is autistic teen Alex Herrman in Glenview, Illinois. He picked correctly the first 2 rounds of the 2010 NCAA March Madness Tournament. Having a perfect bracket through the first two rounds has a 1 and 13,460,000 chance of happening. After finding out the probabilities and possibilities of having a perfect bracket makes me think anyone who actually thinks they have a perfect bracket is just down right stupid. This entry was posted in Uncategorized on September 18, 2015 by lmm6078. The odds of winning the bracket challenge should make someone not even want to bother. But for some reason 40 million Americans will still fill out more than 70 million brackets and bet more than $2 billion. “the number of people who will fill out a bracket is more than voted for either Obama or Romney in the 2012 election” (http://www.dispatch.com/content/blogs/the-bottom-line/2015/03/how-many-people-will-fill-out-march-madness-brackets.html). This makes me think, are we worrying about the wrong thing? Should we be worrying on the science of advertising and gambling? Even though we have such a low chance of winning, something still persuades us to participate. I think we should look deeper into that. I found your post very interesting. I myself do March Madness every year hopelessly try to create the perfect bracket and fail. But you are saying that it is possible? Even thought the chances are practically nothing it is possible to fulfill the perfect bracket, and with this being said maybe someone will pull all the right choices and win. If everybody in the world did around five different brackets someone could have the perfect one and how amazing that would be. Every year, I sign up for Warren Buffets bracket challenge. Every year the team I wish to win gets beaten. Your post was really intriguing. I knew that a perfect bracket was hard to achieve, but did not realize it was nearly impossible. Maybe I should invest my time elsewhere come March. This is a great post for me to read and enjoy because I love March Madness and have been making brackets every year since as long as I can remember. Every year my bracket ends up being busted by the first or second round of games, so I get how difficult it is to be perfect. Even with experience, I did not realize that it was that unlikely to get a perfect bracket. It is really unbelievable how far some people get in the tournament with a perfect bracket, even though they should not get their hopes up too high. This is what I love about college basketball, you never know what will happen and any team can lose any game. I look forward to trying to get a perfect bracket again this year! I found this post to be interesting as I am a huge fan of March Madness. From experience I have never come anywhere close to choosing a perfect bracket as I always struggle in the first round. I found this post especially interested when you gave examples that were more likely to occur than choosing a perfect bracket, that was a real eye opener. Although nobody has ever picked a perfect bracket there was once an autistic child names Alex Herrman supposedly was perfect up until the sweet sixteen. Although the chances are near impossible, however, I will continue to participate in March Madness in the hope of obtaining that perfect bracket. I grew up looking forward to March Madness since June, so this post definitely caught my eye! Every year, my family and I make bets and fill out our own bracket, and it is actually a lot more thought and research than people may think- if you want to do well, of course. When it comes to March Madness, you can never know what to expect and that is the best part about it. Even when upsets ruin my bracket on the first day, I can never get too mad because it’s the most unique thing about the tournament! P.S- Duke will win the national championship again this year! This is very interesting. I knew the odds of getting a perfect bracket were low but I did not realize that they were that low!! I fill out a couple brackets every year hoping that one day I will come close to a perfect bracket. Usually my brackets are ripped up in the middle of the first round, out of frustration though. Cool post! !